An Australian strategist addressed the caucus this week. Conservative Leader Andrew Scheer speaks, as Lisa Raitt and Alain Rayes listen in at his shadow cabinet meeting in Winnipeg on Sept. 6, 2017. WINNIPEG — Don't just oppose. Instead, propose. 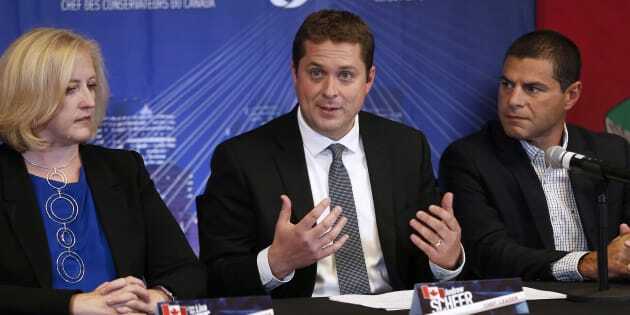 That's the political plan ahead for the Conservatives this fall, and there's a reason Opposition Leader Andrew Scheer is going to repeat it to his MPs a lot in the coming months. When the party hired Australian conservative strategist Brian Loughnane to review what went wrong for them in the 2015 election, one thing he told them was that they had failed to give people fresh reasons to keep voting for the party. In turn, Scheer made the need for positive policy a centrepiece of his leadership campaign. In pulling together the party's fall strategy session this year, the party sought out Loughnane again, asking him to address the caucus at their retreat this week in Winnipeg. This time, it wasn't for advice on what Conservatives did wrong, but how they can set things right. Loughnane spent 12 years directing the Australian Liberal party, which despite the name, is an ideological cousin to the Canadian Tories. He declined interviews, but those in the room say the message that enthralled MPs on Friday revolved around the volatility of the current political landscape. The old orthodoxies around politics — like governments get two terms, or that they're voted out, not in — are a thing of the past, he suggested. Think the surprise results in Britain where people voted to leave the European Union. Or Donald Trump's election as president of the United States. Neither were foreseen by pundits. Issues move people in an instant, the Tories heard, and what matters is what a party is offering when the voters swing their way. So while it has been easy for the Conservatives to go full throttle against a Liberal plan for changes to the tax code, there is only so far they can take the argument, suggested Daniel Hannan, a British conservative who helped lead the successful Leave campaign for Brexit. "It's very, very easy when you're in opposition to criticize and to find holes in everything that the government is doing," he said ahead of his own briefing to the party's caucus meeting. "And even if people agree with you on the issues where you're doing that, simply reflecting people's grievances back at them is not very attractive. You have to offer them a plausible, better, alternative." Is politics about posturing, or is it about results? Once they find that substance, politicians also have to be careful about how they frame it, he suggested. About a year before Brexit, a piece appeared in the Spectator, a British newspaper. It dissected at length the concept of "virtue signalling", a concept understood as the practice of publicly expressing a sentiment in order to telegraph one's own personal character. For example, some say that's what thousands of people were doing when they dumped buckets of ice water over their heads to raise money for research into Lou Gehrig's disease; it wasn't about believing in that particular cause, but being seen via the requisite Facebook video of getting involved in the first place. The phrase has since taken hold in politics, used by both the right and left. In the political realm, the phrase has come to be a stand-in for challenging politicians on the motivation behind their statements. "Is politics about posturing, or is it about results?" said Hannan. That's perhaps why, when foreign affairs critic Erin O'Toole accused the Liberals of virtue signalling when they seek to include gender, the environment and Indigenous issues into NAFTA, it appeared to get under the Liberals' skin. The Liberals say they believe all three are key to economic growth, and while the Tories don't necessarily disagree, they also don't think they ought to be a main part of NAFTA. "What is 'virtue signalling' anyway? It sounds like it came from a bad grad school seminar," Gerry Butts, the prime minister's senior adviser, posted on Twitter after O'Toole made his remarks. But O'Toole was quick to point out Butts had used the expression himself before — suggesting the Conservatives had done it during the 2015 election campaign, though what explicitly he was referring to was unclear. Politicians of all stripes need to be wary of falling into the virtue-signalling trap, suggested Hannan. Take Trump. The way his critics go after him only serves to reinforce his supporters, he suggested. "But he's saved by the virtue signalling of his opponents, who are much happier saying he's a racist, sexist homophobe because it's what makes them feel good. Swing voters block that out, it's white noise."